There's a beautiful studio in downtown Fullerton filled to the brim with vintage furniture and so many treasures - found vintage rentals. They actually just launched their new inventory site -- which is just really fun to look at and swoon over all her hand-picked pieces. 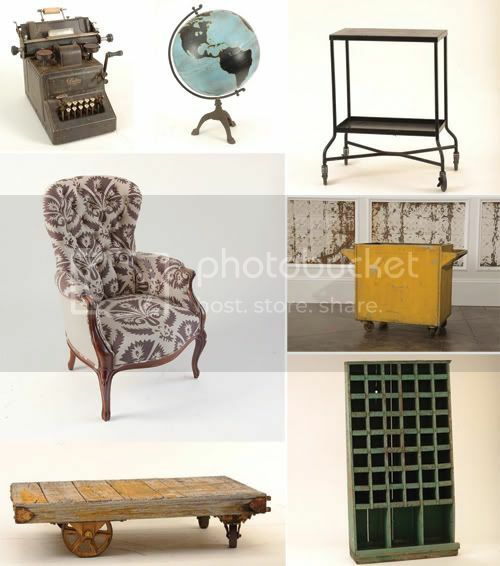 Can you imagine if you put on an event with furniture from found? -- it'd be magical! I actually rented furniture from here for my wedding - Jeni is seriously the BEST to work with and she is one of the sweetest people I've ever met. Check out the found blog, and be sure to follow found on twitter too! Thank you for sharing this store. My parents actually live in Fullerton, so the next time I drive down to SoCal, I'm making a quick stop to Found! Wow, love these industrial/vintage objects. Thanks for sharing them! What a great, green and practical idea! Not to mention beautiful pieces! Awesome!! Oh I LOVE that chair - gorgeous! Love the typewriter too :) Thanks for sharing!